May 1 thru Labor Day Monday. Scroll Down to View 2013 Winners! Each year, prior to the event, the Glen Elder State Park biologist and his crew net and tag a large number and variety of fish. As many different species as possible are included in the contest. In 2013, 365 fish were tagged! A different color tag is used each year so fish can be specifically identified for the current years’ contest. Besides being a specific color, the tags also have numbers and the year on them. Club members recruit businesses and individuals to participate in this event. Participants pledge either cash, merchandise or gift certificate as a prize for the fish they sponsor. Minimum cash or item value is set at $25. In return they also get to “name” their fish. There is no limit per the number of fish a business or individual can sponsor. 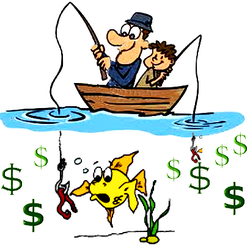 Payouts occur “only” if the fish is caught. Otherwise, they receive FREE advertisement as provided by the Waconda Lake Association in conjunction with the contest. The WLA pledges two fish each year; they are named “Waconda Willie” and “Glen Elder Girl.” If neither of these two fish are caught in the given year, the next year’s fish by the same name increase in value by $100. For example, in 2013 the Association’s sponsored fish were worth $300! Generally, there are also a few other “large value” fish just waiting to be caught. In 2013, for example, there was one fish worth $700, two $500 fish and a $400 fish! To participate, a fisherman must purchase a $10 entry ticket BEFORE they begin fishing; the ticket is also good for “immediate” family members! Tickets are available at several businesses throughout the Waconda Lake area. Caught fish can also be verified at these locations. What rule(s) have to be met to claim my prize? The fish must be verified at a recognized check-in point. The fish must be lively, in other words “freshly caught” with the proper tag still intact to qualify. After the fish has been properly verified, the tag is removed and the lucky fisherman or woman is given a certification form. The form can then be taken to the fish’s sponsor where the prize can be obtained.